Zakynthos is one of the better known islands of the Ionian group. It's second only to Corfu. Zakynthos has an area of 410 km2. Almost 40.000 people live her making it one of the more densely populated Greek islands. The local capital (Zakynthos City) with its Venetian architecture is rather pretty. The town was pretty badly hit in the 1953 earthquake that left most of the Ionian Islands in ruins. Most tourists coming here are package holiday makers. Zakynthos is most famous for the fantastic beaches, picturesque bays and of course the night life. Despite that it isn't overrun by tourists which is nice. There are still nice and quiet corners on the island so you can find your private little paradise. For some that is a tranquil fishing village for others night life and party 24/7. One has to say that Zakynthos handled the challenges that mass tourism present rather well. Most visitors leave with pleasant memories. One of the big pros on Zakynthos is the sea. It is incredibly clear. This attracted a number of diving schools. 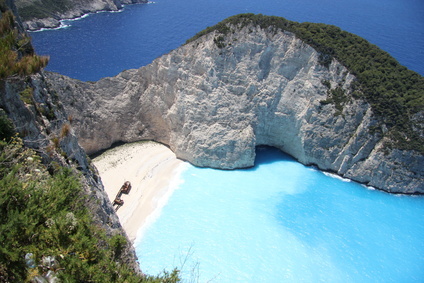 Also; Zakynthos has some of the finest and most beautiful beaches of all Greece. The island is one of the most popular themes on picture postcards for this very reason. Many of the secluded beaches can only be reached by boat. The most famous beach is probably Laganas in the southern part of the island. This has a lot to do with the loggerhead sea turtles (Caretta caretta) that lay their eggs there in summer. Ecologists put strict regulations in place to protect the turtles. If you like jet and water ski you may want to go somewhere else. 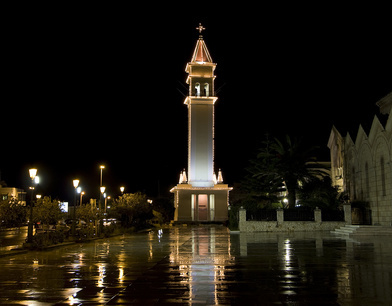 Zakynthos city – especially be Greek standards - is quite pretty. The Venetian architecture is picturesque and gives any city a touch of warmth and beauty. Zakynthos is no exception. There are numerous fine taverns and restaurants here and they cater for all tastes. Beside local Greek cuisine you will find all different kinds of international dishes. Paradise Camping is modern and well looked after camp site in Messo Gerakari. It's about 10 kilometers north of the port meaning it is a bit out of town. On the other hand it is quiet and the sea is clear even by Zakynthos standards. It actually got some awards from the EU. Other than that there are plenty of rooms to rent. Prices start at 20 Euro. Even in high season one doesn't have much trouble finding a room. There is a wide choice from basic rooms to luxurious five star hotels. 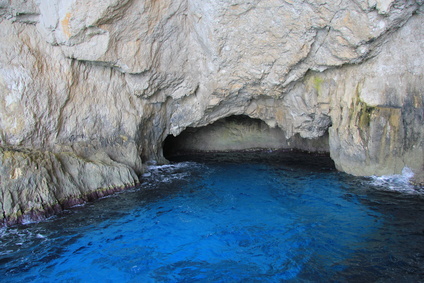 One of the main attractions on Zakynthos is Askos Stone Park. It is a private nature park near St. Nicholas in the north of the island. Parts of it are open to the public. It's a bit like a Zoo. In the open parts you can see some native and some imported animals. The restricted parts are reserved for wild animals. Askos Park is one of the few retreats where you can find Platoni deer. As the name suggests there are also several stone structures like old stables and basins where they collect water. Zakynthos has a busy international airport (Dionysos Solomos Airport). The island is one of the prime directions for package holiday makers so there is no shortage of flights from all over Europe. Other than there are flights to and from Athens and – bizarrely enough – Corfu. Zakynthos also has a busy ferry port. Depending on the season there are up to 8 ferries a day to Kyllini on the Peloponnese. Busses from Patras and Athens are scheduled to synch with these ferries so it is no problem whatsoever to get from and to there. There are also boats to Kefalonia.